Attractions. This peak, lying east of Diamond Head and also called Windy Knob, offers good telemark/randonnee skiing and snowshoeing ascents close to the Wenatchee Valley corridor. Descent options with different exposures and tree coverage yield the possibility of good snow in many different weather cycles, avalanche cycles, and seasons. 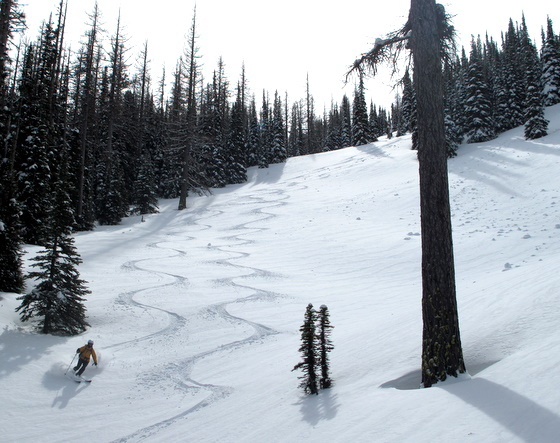 In winter and early spring, this non-motorized area is a good place to find Eastside powder. Activities. 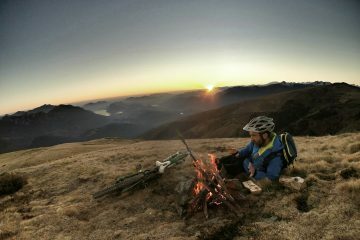 Telemark skiing, randonnee skiing, snowshoeing. Access. From the Highway 2 – Highway 97 junctions (Y Junction), drive south on Highway 97 toward Blewett Pass. Several miles beyond Five Mile Road and about 1 mile before (north of) Blewett Pass, park at the Tronsen Meadows parking area (Road 7240). This is a trailhead for non-motorized use only. Elevation Gain. Start 3,900 feet. Highpoint: 5,930. DISTANCE. Roughly 7 miles (round trip). Trip Description: Note: The normal USGS map for this area does not show all the roads, trails, and ski trails that have been established. The first few times you visit, use this map (below) to get a handle on how the roads and trails run. Note: the roads and trails we’ve added are not from GPS data, but are reasonably accurate approximations. From the parking area, ski about 0.8 miles up the road. At a prominent 3-way intersection, take the right spur. Go another 0.25 mile on this road and at the next Y, take the smaller right spur. This spur drops a hair at the very start, then contours (it curves as it contours while the road you turned off goes straight). Go a few hundred yards and look for a trail marked by a blue arrow sign on the left side of the road about 75 yards before you enter a ponderosa pine meadow. If you reach this pine meadow you’ve gone too far. Turn left at blue arrow sign and start climbing more than contouring. The trail goes up and heads slightly right (as you climb). After roughly 0.35 miles, you’ll intersect a sizable road that Nordic skiers use. Cross over the road and keep climbing up the fall line. In a few hundred yards where you will now come to a marker tree with several small, non-forest service signs. Turn left, following the sign to Haney Meadows (going right leads to Sauk/Blewett Pass) which is 2.7 miles away. Follow this trail on a long, gradually climbing contour for roughly 0.75 miles. Along this contour which follows on the west side of a small creek drainage, you’ll pass under few big open slopes which, if avalanche conditions are low, allow a good ski off of Diamond Head. About 0.75 mile from the marker tree (at about 5200 feet), the trail takes a sharp hook to your left (east). Take that hook and contour in an easterly direction. Keep heading east as you ascend a natural gully system on the SW side of the peak. Keep climbing this drainage until reaching a shoulder on the SE side of the peak just a few hundred vertical feet from top. Follow the SE ridge to the summit (elevation 5930 feet). Diamond Head East has some terrific skiing on its northern and northwestern slopes. The drop off the summit is steep and hazardous in unstable snow conditions. 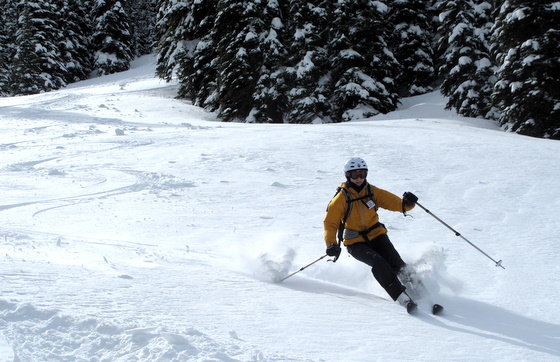 After skiing the north or northwestern slopes, a gentle contour through the woods in a westerly direction will return you to your approach route. Or, you can keep descending fairly thick forests (tricky skiing but easy snowshoeing) and intersect a logging road near the 4,600-foot level. 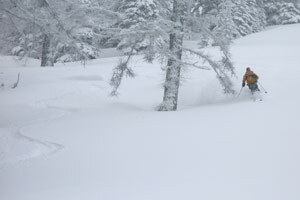 If conditions are not stable for skiing the north or NW slopes, descend the ascent route. Hazards. The summit slopes (especially the north- and NW-facing slopes) are steep and need to evaluated carefully for their avalanche hazard. 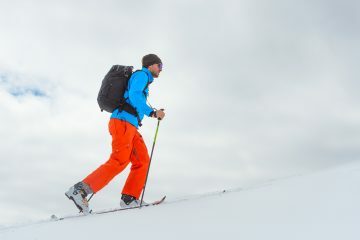 Ski with a partner; know how to evaluate the hazard (e.g., dig pits), choose another option if the snow analysis of the slope you’re intending to ski reveals some hazard, use proper skiing protocol (ski from safe zone to safe zone exposing only one person at a time), and carry (and know how to use) all the proper safety equipment (transceiver, shovel, probe, first-aid supplies). 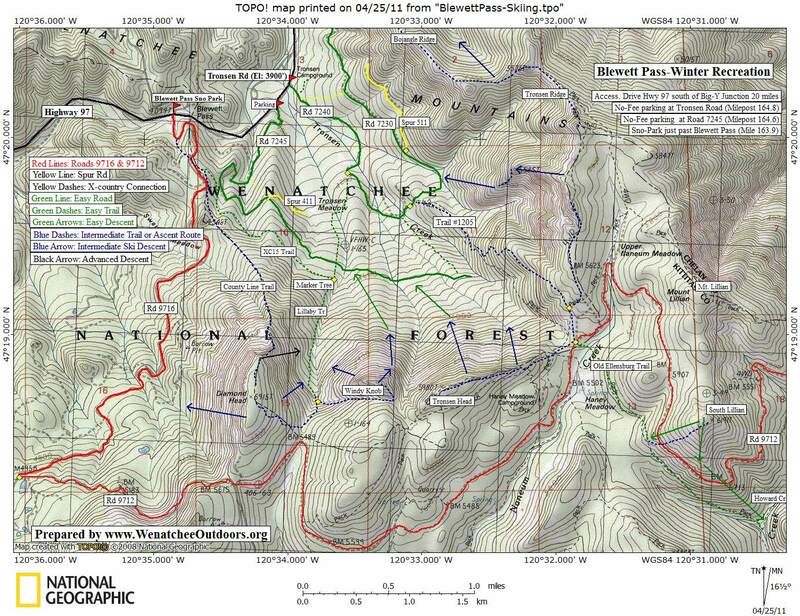 Maps: See our topo map (above) and the USGS 7.5-minute Series: Blewett Pass. Note: Our name for this peak is unofficial. The peak bears no name on USGS maps, but some locals who know the Blewett Pass area well call it Windy Knob. We call it Diamond Head East because it is the peak immediately east of Diamond Head and because we think many regional people haven’t heard of Windy Knob but have heard of Diamond Head. Permits: As of March 2011, the parking pullout did not require a Sno-Park permit (no signage indicating a permit was required). Trip Reporter: Andy Dappen, March 2007. Updated March 2011.